On Friday night I received a very unexpected honour, and was presented with the award for the Western Australian Spatial Professional of the Year for 2011. AJ, Andrew and Tom had schemed and connived to nominate me for the award, and managed to keep me in the dark about it. I was recently on holidays when Tom sent me a message saying I was requested to go to the WA Spatial Excellence Awards dinner, but not why. Then when I was back in the office the Monday before the awards I heard I was nominated for ‘something’. So I was in the dark until the award was presented during the dinner, and that whole ‘catch up after holidays’ madness also helped them keep it a secret. All of a sudden at the dinner, I’m being asked to go and receive the award, which was quite a surprise. 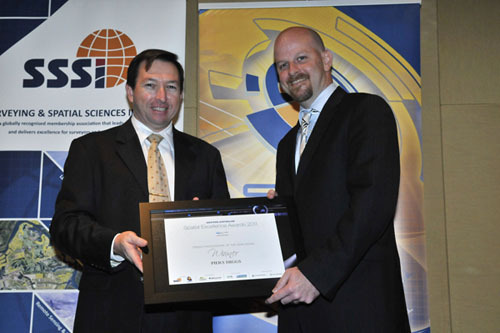 I found it quite humbling (and still do) to get this award – some big names in the WA spatial industry have gotten this award in the past, and some of them have been my mentors and bosses during my career in the spatial industry. Many of the things that the guys included in my nomination (below is a scan from the booklet) are things I saw others do, or things I thought would be just the ‘right’ thing to do. I’d also like to say a big congratulations to the rest of the winners of the awards. There were some really good industry projects in the commercial projects categories this year, as well as some outstanding individual achievements. I particularly was impressed with Stuart Gralton’s student project, where he walked over 600kms through the Australian Alps and used open source software the whole way through his project. Nice to see the education areas starting to embrace open source in their teaching and project work. 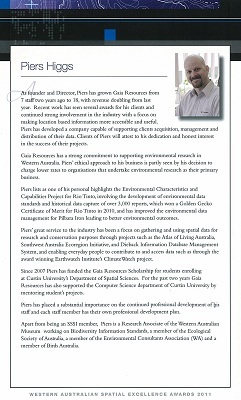 I am very grateful to the spatial industry for this recognition, and will keep on striving to do the right thing by my staff, colleagues and clients. The next year or two have some very interesting projects coming up for Gaia Resources, both internally and externally, and awards like this let us know we’re on the right track.